Please join us at the Save the Bay Center for our annual meeting. After a review of the past year for the organization and a light dinner, we'll hear about 1:1 implementation strategies. We're excited to be having Justin Reich, an educational researcher at Harvard University, speak to us about successful 1:1 implementations. Your school has decided to go ahead with that 1-1 rollout: what now? In this session, we'll examine some of the critical considerations for educators leading 1-1 efforts in schools and districts. We'll explore a checklist of key strategies for success, drawn from research and exemplar schools and systems. Justin Reich is an educational researcher interested in the future of learning in a networked world. He is the Richard L. Menschel HarvardX Research Fellow, based in the Office of the President and Provost at Harvard University, exploring the possibilities and limits of online learning through the HarvardX platform. 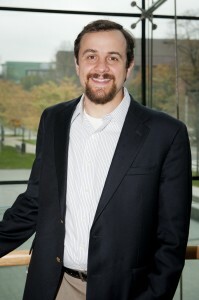 He is also a Fellow at the Berkman Center for Internet and Society, a Lecturer at the Harvard Graduate School of Education, and a lecturer in the Scheller Teacher Education Program at MIT. Justin is the co-founder of EdTechTeacher, a professional learning consultancy devoted to helping teachers leverage technology to create student-centered, inquiry-based learning environments. He earned his doctorate from Harvard University, where he led theDistributed Collaborative Learning Communities project, a Hewlett Foundation funded initiative to examine how social media are used in K-12 classrooms. He writes the EdTechResearcher blog for Education Week, and his writings have appeared in The New Yorker, The Atlantic, Educational Researcher, the Washington Post, Inside Higher Ed, the Christian Science Monitor, and other publications. Justin started his career teaching wilderness medicine, and later taught high school world history and history electives, and coached wrestling and outdoor activities.